Students wishing to carry out their dissertation research at the Cyclotron Institute must be formally enrolled in the graduate program in the departments of Physics, Chemistry, or Nuclear Engineering, but may elect to work with any Institute faculty research advisor, irrespective of that advisor’s departmental affiliation. Research programs at the Cyclotron Institute are generally funded by the U.S. Department of Energy, the National Science Foundation, and the Robert A. Welch Foundation. Click here for the seminars archive. Yeunhwan Lim has received the Bosan Prize (in Korean) in Nuclear Physics from the Korean Physical Society in support and recognition of outstanding researchers in nuclear physics. Prof. Folden will be featured in the American Chemical Society's Program-in-a-Box on "The Evolving Periodic Table and its Incredible Elements!" on February 26, 2019. 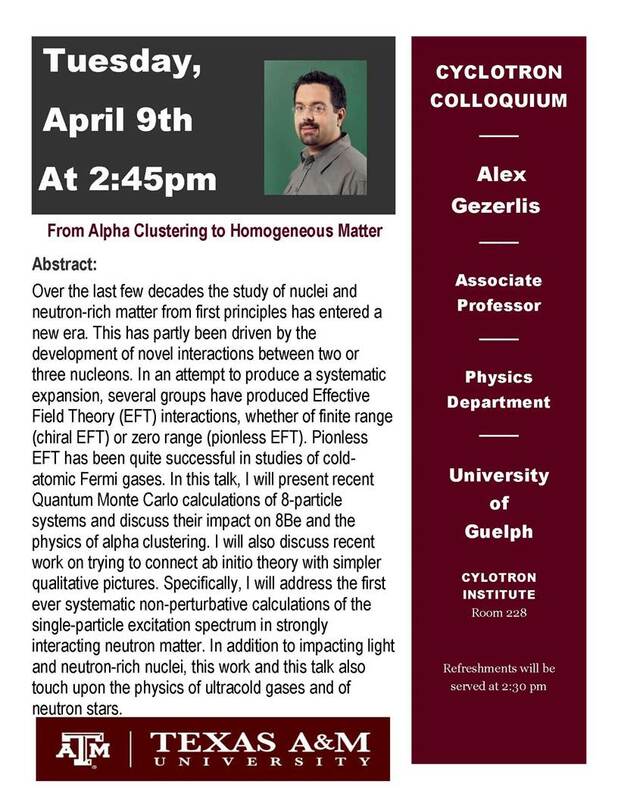 He will be discussing superheavy element science. Information on the Visiting Scholar Program has been posted. The website for the Top Row CKM Unitarity Workshop in honor of Prof. John Hardy is now available. Prof. Saskia Mioduszewski has been named a Texas A&M Presidential Impact Fellow! Our student Mallory McCarthy has been featured in a Labors of Lab video. You can also see previous videos featuring Layla Bakhtiari and Kassie Marble. The Cyclotron Institute's annual report for 2017-2018, Progress in Research, is now available. A consortium led by Texas A&M has received a $10M grant for training and workforce development from the Department of Energy's National Nuclear Security Administration. Read the press release here. Prof. Folden has received the 2018 Distinguished Achievement College-Level Award in Teaching from the Association of Former Students. The Cyclotron Institute has been featured in an article by the Welch Foundation, a major supporter for over five decades. Nuclear physics at Texas A&M has been ranked seventh nationally by U.S. News & World Report! Our 50 Years of Beam symposium has been covered by The Eagle, The Battalion, and the College of Science. Photos from the event are now available. A video on the 50 years of beam is available in normal and extended lengths, as well as a video about the Institute itself. The 50 Years of Beam symposium website is still available. Read the letter we received from the Department of Energy regarding the 50 years of beam at the Institute. Prof. John Hardy's 2009 paper on superallowed beta decays has been featured on the DOE's list of 40 Years of Research Milestones. The progress report for 2016-2017 has been published. Prof. Jeremy Holt has received an NSF CAREER award. Prof. Robert Tribble has been nominated for and accepted for membership in the Academia Europaea. Graduate student Zilong Chang has been named as one of two RHIC/AGS Thesis Prize winners for his work on pp Collisions at STAR. Prof. Che-Ming Ko has been named a University Distinguished Professor. The website for our symposium in honor of 50 years of beam at the Cyclotron Institute is now available. The Heavy Elements Group has been featured in a DOE Science Highlight. Information on the Isotope Production Workshop has been posted. The College of Science has also prepared a news article about the workshop. The Cyclotron Institute has been discussed in a blog post on Planet Analog.